Why not set a new year’s resolution to provide you and your family with cleaner indoor air? Improve you and your family members’ health, reduce your exposure to dust , chemical household fumes, gases, odors, and fragrances – breathe cleaner air, feel better, rest better, help your body build up and strengthen your immune system. Air Tube provides a powerful, yet portable option for users who want clean air that travels. Choose from the Air Tube Supreme & AirTube both of which feature the unmatched power of impregnated activated MAC-B™ carbon and HEPA filtration in a fully portable unit. The cylindrical shape maximizes air flow, while the all-metal casing prevents plastic off-gassing. AirTube line replaces the Allerair 3000 series portable, desktop, tabletop, air filtration system. Total weight of only 14 lbs., the AirTube offers significant power and filtration in a fully portable format. Variable speed motor, whisper quiet option ideal for bedroom use or in spaces of up to 400 sq. feet. Formaldehyde is an organic compound with the formula CH2O. It is the simplest form of aldehyde, hence its systematic name methanal. The common name of the substance comes from its similarity and relation to formic acid. A gas at room temperature, formaldehyde is colorless and has a characteristic pungent, irritating odor. It is an important precursor to many other chemical compounds, especially for polymers. In 2005, annual world production of formaldehyde was estimated to be 23 million tonnes (50 billion pounds). Commercial solutions of formaldehyde in water, commonly called formalin, were formerly used as disinfectants and for preservation of biological specimens. In view of its widespread use, toxicity and volatility, exposure to formaldehyde is a significant consideration for human health. On 10 June 2011, the US National Toxicology Program described formaldehyde as "known to be a human carcinogen". Formaldehyde is a naturally occurring substance in the environment made of carbon, hydrogen and oxygen. Natural processes in the upper atmosphere may contribute up to 90 percent of the total formaldehyde in the environment. Formaldehyde is an intermediate in the oxidation (or combustion) of methane as well as other carbon compounds, e.g. forest fires, in automobile exhaust, and in tobacco smoke. When produced in the atmosphere by the action of sunlight and oxygen on atmospheric methane and other hydrocarbons, it becomes part of smog. Formaldehyde has also been detected in outer space (see below). In photography, formaldehyde is used in low concentrations for process C-41 (color negative film) stabilizer in the final wash step, as well as in the process E-6 pre-bleach step, to obviate the need for it in the final wash.
Formaldehyde is used extensively in the woodworking and cabinet-making industries. Urea-formaldehyde is used in the glues that bond particle board together. The particle board is used underneath wood veneer and plastic laminate. Cabinets, bank counters, and veneered and laminated woodwork all use particle board containing urea-formaldehyde under the plastic laminate and wood veneer. A vital tool in workplace health and safety, this industrial air cleaner is designed to remove toxic fumes directly at the source. A spark arrestor is also standard on this unit. Choose from different blends of carbon to address a wide variety of airborne pollutants including manganese, chromium and nickel. Dimensions: 22.5” X 16” X 29”; Weight: Approximately 176 lbs. Multiple purpose air cleaner, can be hung or suspended from the ceiling, can be installed above the ceiling – with air intake and clean air exhaust ducting via a flex hose, or simply wall mounted. 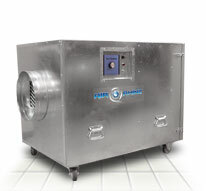 Multiple filter configurations and motor blower speed available. Multiple purpose air filtration system, air scrubber, air cleaner, air filter system for dust, odor, chemical fumes and gases removal and or reduction – uses tried and proven filtration media - HEPA filtration, Activated Carbon, Activated Charcoal Gas phase adsorbent, chemical filter. 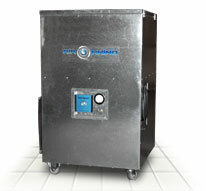 Yes, the AirRhino provides Dust, Molds, Odor, removal, reduction capabilities. Free shipping* on all Allerair Home and Office air purifiers, air cleaners, air scrubbers, air filtration systems for a limited time offer. Order your air filtration system today and yes, get FREE SHIPPING. All units are factory fresh, shipped direct from the factory to you, built from scratch, for your individual needs, incorporating the right filter combination for your application. Crackling fire in the fireplace, roasting marshmallows, hot chocolate, soft music, holiday music playing in the background – that’s all so cool. What’s not so cool sometimes is the odor of the burning wood, log, the smoke that gets in the room. We have air filtration systems, air cleaners, air purifiers, air filters that can help you keep the mood and ambiance right for the moment – portable, quiet, efficient, and effective. Central Air, Whole House, Air Filtration System connects easily to any ducted central furnace system to filter the air in the entire home – remove, reduce dust, dust mites, dander, molds, mold spores, odors, chemical gases, fragrances, and other pollutants and irritants. HEPA filters, by definition, remove at least 99.97% of airborne particles 0.3 micrometers (µm) in diameter. Some manufacturers use HEPA material in their filters and claim that these are HEPA filters. Quatro Air certifies our filters as HEPA which means that they go through a vigorous testing procedure and meet medical standards for filtration. Diffusion predominates below the 0.1 μm diameter particle size. Impaction and interception predominate above 0.4 μm. In between, near the 0.3 μm MPPS, diffusion and interception predominate. 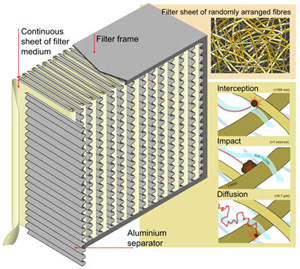 The filter resistance to flow is known as its pressure drop.